After returning to a lower altitude and rehydrating it was time to eat. 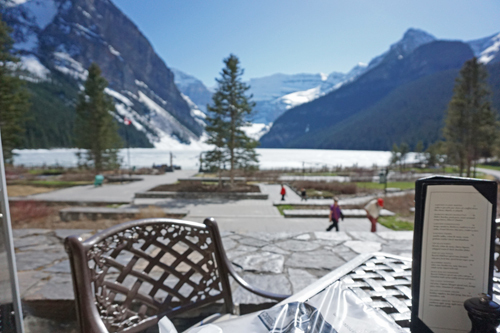 A good place to do that seemed to be at the Fairmont Chateau Lake Louise, it was on my list. 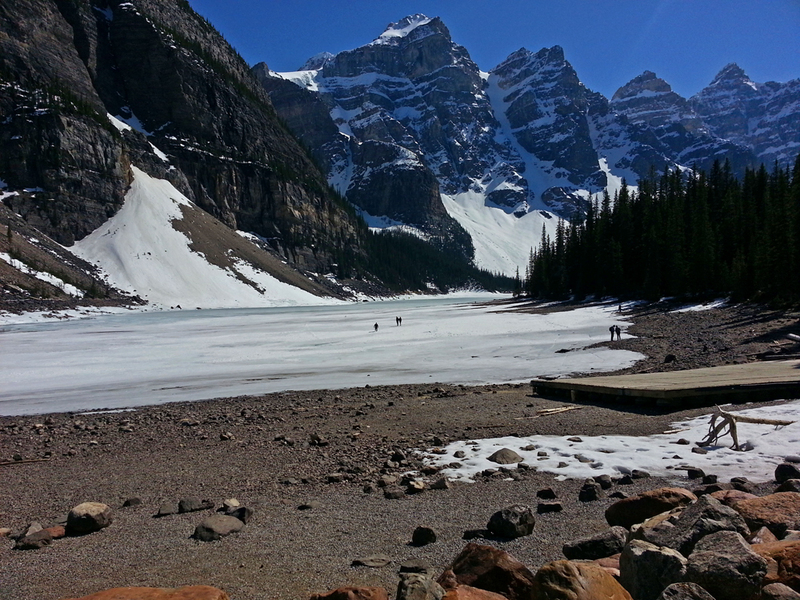 As I was headed there, the sign for Lake Moraine appeared, I’d been advised not miss that either. I was super tired but there it was and there I was and I all I had to do was turn the steering wheel. And keep turning the wheel as the trusty LT’s very loud fan kicked in, up, up and up we went. The road is 22km, definitely seems longer on the way up than the way down! Slow and easy is the key here, it may not be a road for most RVs, but for my little baby no problem. The lake was frozen and the Lodge was closed. Still I was happy to be there. 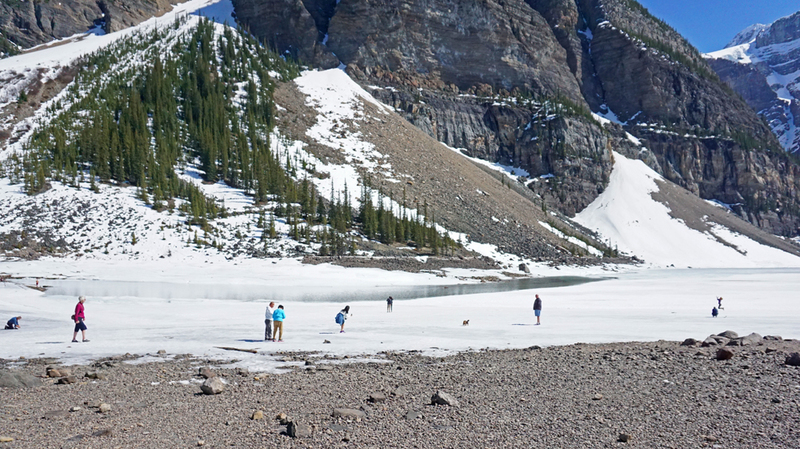 I saw a couple of little dogs with their people having a blast on the ice. 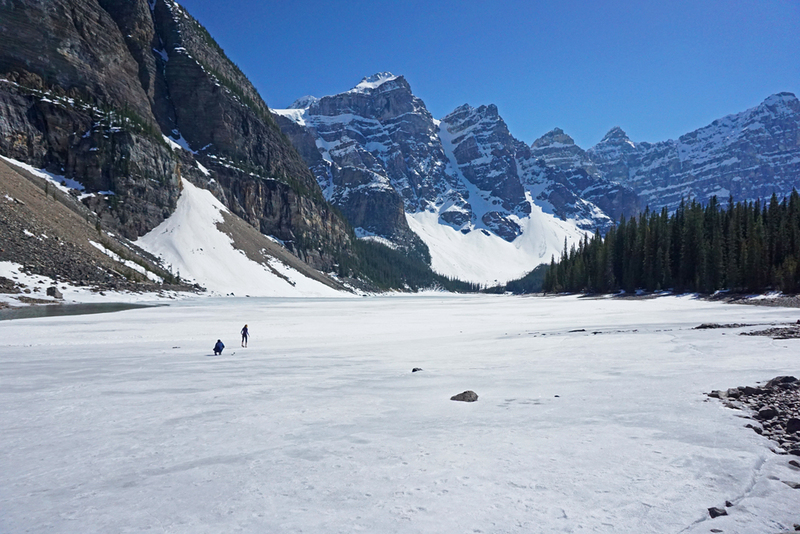 Lake Moraine: wonder how crowded this gets during the season? Fairmont Chateau Lake Louise, I was so tired by this time that the walk from the parking lot to the Lodge seemed almost more than I could do. When you have an RV you need to be a strong walker. Even a little one like mine goes in the farthest away parking area. How come not even once have I seen that little cars have to park far away or buses or SUVs or motorcycles, why is it always RVs? Guess what, the lake was frozen! There was a bit of a melt going on. I had a root vegetable salad not a lot of food, but just right with a few cold glasses of delicious tasting water sitting outside overlooking the lake in the late afternoon. It was an awkward meal for reasons I’m just not going to mention and I felt very very sad. It seems the spirit in me had left and gone off to find another human who would give it more pleasure. My intent was to drive to Calgary in what was left of the day but I couldn’t do it. Instead my obligation came to a close and I was on my own. I don’t know if I did everything I could or not to do the best I could, but I was worn out. 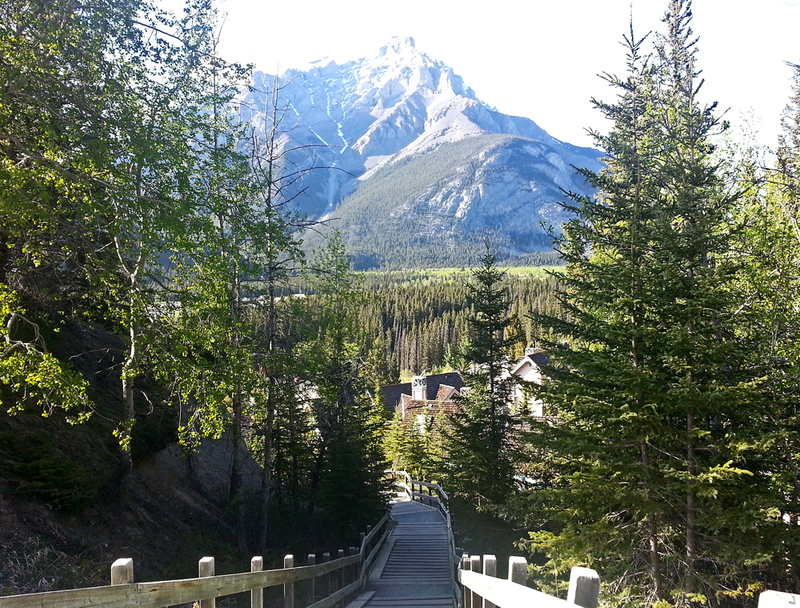 I found a hotel in Banff, a mountain resort up on the hill. They kindly found room for the LT and I crashed in my sweet comfy king size bed enjoying the whirlpool hot jet bath and the steam shower for a few days, I never turned the TV on or used the pool. 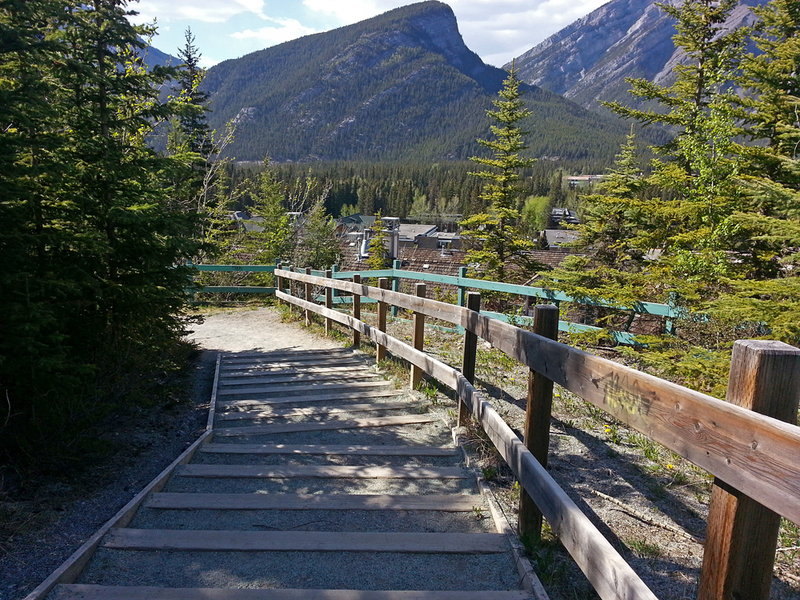 A few times I walked down and back up the steep hill to the town of Banff. My resort provided a free bus pass but I walked. The walk was more interesting to me than the town. I had to do it spurts since it was so steep and would make my heart pound all over my body. I didn’t go into even one of the stores or enter any of the sights but I’d stood on the bridge and watched the traffic. I sat somewhere and watched all the people bustling around. 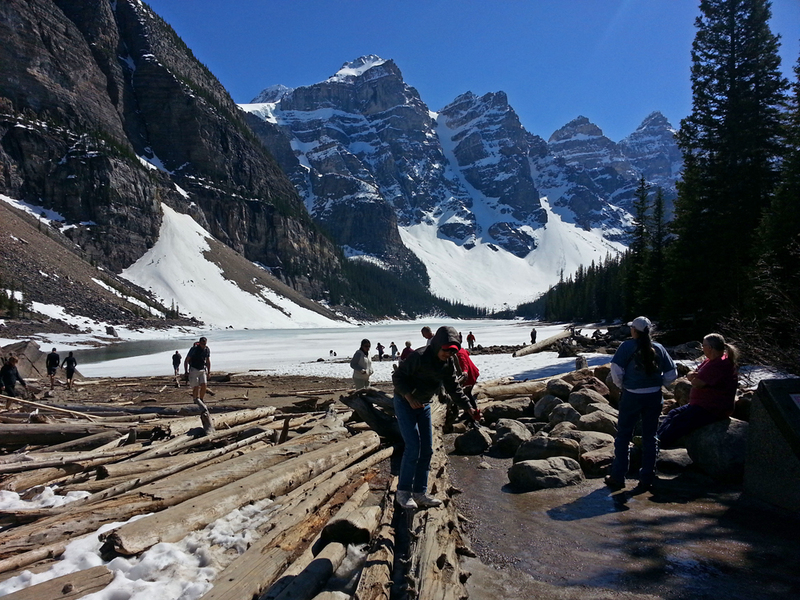 Banff was very crowded. People I didn’t know responded with kindness and people I did know too, my mother was my biggest fan, friends sent texts or phone calls, Lee took pictures of my pups. I read the Buddhism books Lee’s husband Craig had lent me, sitting with my laptop, camera, a drink of mixed water and juice and later a bottle of complementary wine, a bit of food, out on my patio, thoughtfully there was an electrical plug, a few chairs, a little table and a peaceful view. Mindfulness and freedom from suffering, kindness and compassion, responsibility and action towards all creatures including rocks and rivers and the balance to do ones best to relive pain but also to let others suffer if they needed to. It was what I needed. I could have stayed another day, I could have stayed a week or more, but I became annoyed with the cleaning crew at my resort so after a few days I took off. I washed some clothes in the sink before I left and the big thing, I put away all things Alaska, cleared out stuff I no longer needed to see or deal with in the LT; it was time to start over again. Slipping down the short cut from my resort on the mountain. Still going down the short cut and back up! 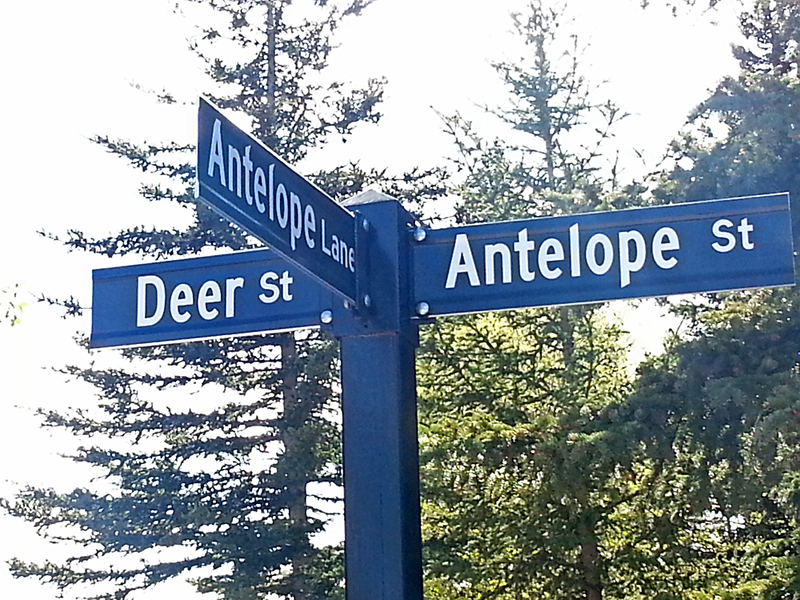 Where The Deer and the Antelope Play! I found it!!!! No dog show today Even with Olympia looking super, or she was, right now she has grease on her rear but we’re back home. 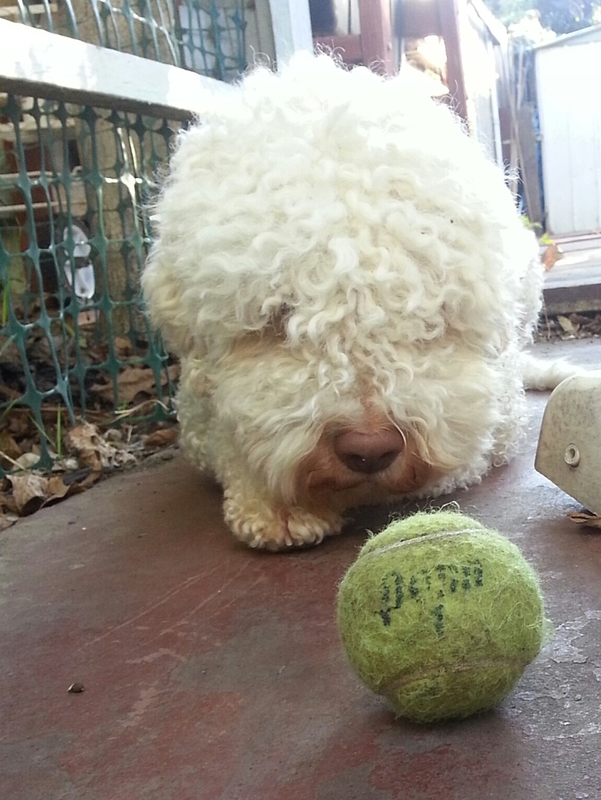 Today was the AKC SLO dog show in Paso Robles; we were the only Lagotto Romagnolo entered so easy win to get Breed (Best In Category) and likely we would have won Miscellaneous (our Class) to earn a few points for her Certificate of Merit (COM) which in dog show speak, is the title you can earn when your breed is new to the American Kennel Club. Little Curl Puff, had two baths this week and a carefully managed coat, not so easy in a breed that naturally felts and particularly not when it’s Olympia who loves LOVES dirt and cannot resist a good roll and waggle in piles of sticky leaves, debris, mud, fertilizer, sidewalk scum . . whatever comes her way. We had the trot thing rehearsed and unlike the disastrous last time at the Santa Barbara show when Olympia was coming out of her false pregnancy / hormone high she was all happy girl excited , . . . she was gonna show me how it was done, strutting her stuff for the judge, it was a done deal. I left a little later than planned but plenty of time. Decided not to enter the printmaking show in spite of urging by the show committee so I could concentrate on Olympia, decided not to do this and that, and the other things… all for my pup. Olympia deserves titles, the only thing holding her back is me, I find dog shows stressful and her pacing drives me nuts, but when she trots that goofy waddle turns into smooth movement. Half way up the Cuesta Grade, it happened, the big kahuna (this video is going the other way… I was heading North, but I liked the whirl of the road: At first the Ford slowed a little, no problem, I turned the air off and eased up on the accelerator, no point pushing, we were almost there, just a few more miles. 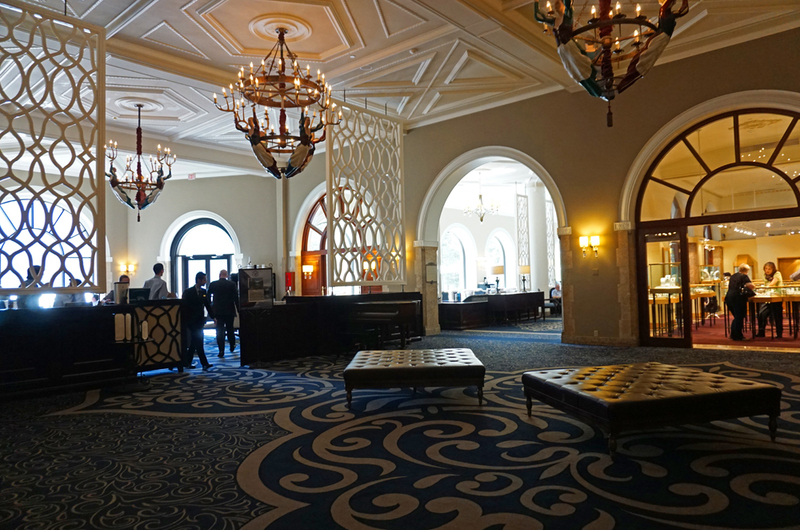 My mind was already working though our perfect trot, doing a little vendor browsing, chatting with some friends…. it’s been a stressful week, my heartache flaring along with a sinus trouble, but so what, life goes on and the road ahead will have new joys; yet when the Ford died my heart was pounding. Stuck on the shoulder with semis whipping by, the heat cresting and worst of all the clock ticking. Where was the background music and the fade to panorama? AAA sent someone out within 20 mins, I told them it was an emergency, the operator was from LA she had no idea what the Cuesta Grade is, she wanted an off ramp to pinpoint my location…. hmmmmm… if there was an off-ramp don’t ya think I could have taken it and removed myself from one of the most dangerous sections of the hwy? This is a scary place to be stuck!!!! Oh yeah, never mind in LA traffic moves at 17 mph. I got to test out my improved jerk handling skills with tow driver #1. He was a younger sort and a bully. I could put up with his ordering me around and getting me to go sit in the cab of his air condition truck, it was hot. He didn’t offer any water or anything like that and apparently the AAA rescue squad does not carry items like antifreeze, way too advanced for them. We got into it about my dog…. he didn’t even notice the dog. “Dog can’t ride in the cab, lady, you see I’ve got to watch out for customers that are allergic to dogs.” I’m probably being too nice with my quote, as I told him 1) my dog wasn’t the kind people were allergic to, 2) she is valuable, 3) she is extremely important 4) if he insisted I would put her in her crate (there was no place inside the cab for her crate) or I’d carry her and hold her in my arms. The guy was a…. XXXXXX moron, control type . . . you get it? Is this really AAA policy, even with a window cracked open I don’t want to think about the outcome of a living creature alone in a box on a hot day. It takes only minutes to cook up in a car, easily can rise to 160 deg or more even if with windows cracked down a bit. It was easily 90 deg out, so how long would Olympia have before her tongue started to hang out, then curl and darken with heavy panting, her eyes would bulge and glaze over, then her heart would start to beat too fast . Parked cars are deathtrap for dogs: On a 78-degree day, the temperature inside a parked car can soar to between 100 and 120 degrees in just minutes, and on a 90-degree day, the interior temperature can reach as high as 160 degrees in less than 10 minutes. He ignored me, repeating his manifesto with his dictate to remain seated. I didn’t, I got out and let Olympia out of the backseat of the Ford, walked her around, gave her some water, then I picked her up and somehow, no help from Mr Jerk, clambered up into cab without letting her beautiful paws touch anything other than me. I announced to the driver that if he didn’t allow her he could just leave and I’d stay there on the dangerous hwy with my dog. He had my keys and had already chained up the Ford. I felt like I did when my Mom dumped me on the street in Europe with no wallet, no pocket change, no sweater, no name of hotel, nothing and drove away. She came back while I still figuring out what to do but really I would have managed. As soon as we were underway he got on the radio, “I’m only taking you down the hill,” he told me, “another truck will pick you up from there.” I was relieved, he was stony and I didn’t have a chisel. I was supposed to wait in the lot for 1/2 hour and use the hotter than hell outhouse around back over the slightly less hotter than hell blacktop. I could hear him tell the other driver about my evil dog. Driver #2 had a flatbed truck, I liked that, rather than having the Ford dragged like a child by its hair and even before he got out I saw him smile at Olympia. Oh wow! I was happier. We stopped for gas, we stopped and got some drinks, we got water for Olympia and a little walk, we stopped because I needed the rest stop. He even washed his hands so he could pet and play with her although she’d already gotten the grease on her by then. I thought we would need to have the big flatbed tow truck towed, it sputtered, the air conditioner kept cutting out so we had the window wind blasting us, he gave me his book of maps to cover my legs which were burning. The tow truck groaned and made noises that it shouldn’t have made as we chatted, little Olympia in-between us on the front seat. We were talking about trips and GPS systems so you could travel alone as I do and still find your way but he reminded me how much fun it is to get lost, to discover places because you didn’t know you’d be there. He made the day kinda fun, a temporary find, a friendly hand…. we talked about the attitude of offering cheer when things go wrong, He’s a dog lover, a good kind of people. 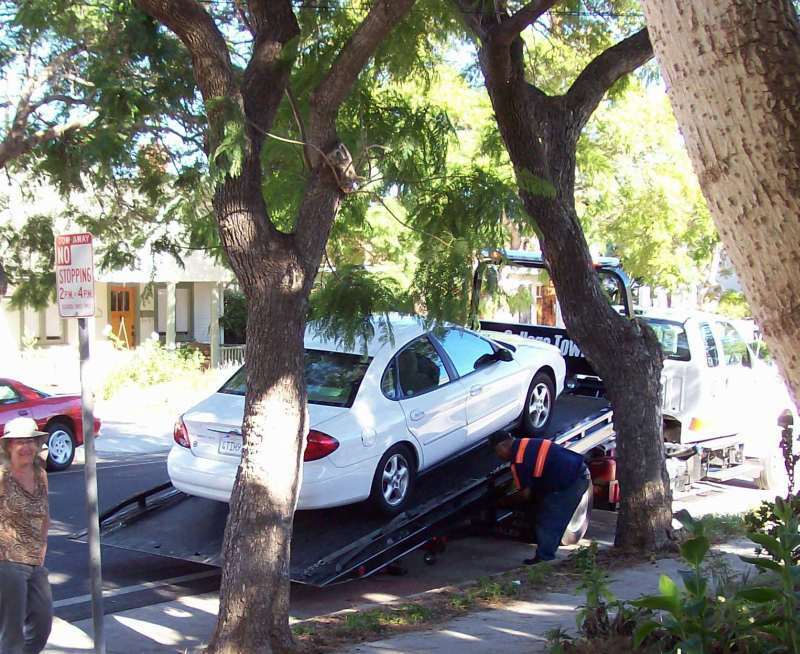 So thank you AAA Premier for the tow. Got home in time to pick up Mason and take them both for a romp at sunset. Time and Money of course down the drain . . . lost on the highway . . . when will the winds blow the other way? So many troubled years, cursed bad luck. Which direction should we head? Maybe it’s time for getting lost. Here’s a shot of Olympia showing us that her favorite thing in life is round. Sorry readers!!! Just got a notice about ads being added to wordpress.com unless I pay, I don’t want that for you or for me so I’ll move these blogs as soon as I’m able . . . until then please use an adblock program!!! !